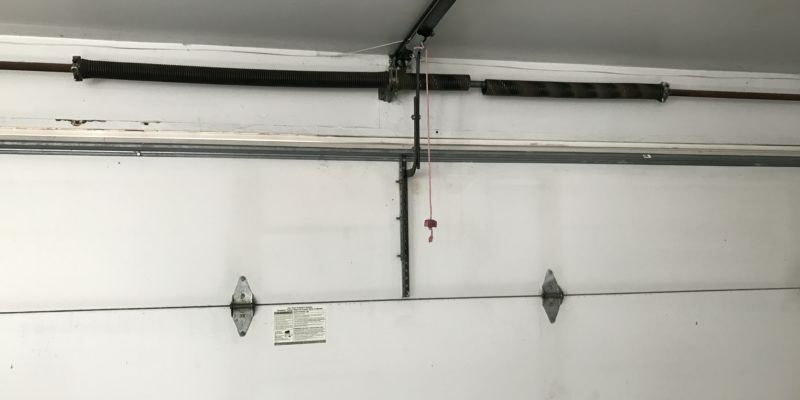 If you have a rollup door in the garage, there’s a huge spring that hangs just above the assembly. 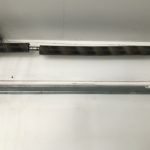 Referred to as the torsion spring, this part takes on the weight of the door as it lifts and lowers several times a day. It makes sense that the spring will fail at some point. The tension involved is extreme, especially with garage doors weighing 200 pounds or more. Learn what to do if the torsion spring fails so that everyone is calm and collected. A failed spring in your garage produces a loud bang when it finally snaps. On carriage-style doors, there are relatively small springs that line up vertically along the sides. Torsion springs are much larger, however. They’re confined within a housing so that a break doesn’t cause damage to the surrounding environment. You’ll hear a loud “bang” when the torsion spring fails. Don’t panic when you hear this sound. It’s startling so carefully look in the garage after the sound occurs. The spring may look bent or even cracked. Every failure produces a different reaction. After you verify that the spring is the cause for the sound, clear the garage area. The door will probably be closed at this point. The spring supports the door’s weight so most failures leave the garage in a stagnant position. If the door was in motion when the spring failed, the panels may have hit the ground with blunt force. Extensive damage might extend from the spring and into the entire door assembly. Ideally, stay away from the area. Contact professionals to evaluate the situation. The door and spring won’t move any further, but you don’t want children or pets around the area for safety purposes. Contact garage door specialists who understand torsion springs. Modern doors have this construction, which requires training and experience on the part of the service personnel.Professionals who’re unfamiliar with torsion springs may not have the tools or technique to safely install the new assembly. What to do if the Torsion Spring Fails. The best way to ensure a safe repair is by hiring the company that installed the door. They’ll be familiar with the model, parts and your physical property. Remember that you won’t be able to use the garage until the spring is replaced. Any items within the space, including vehicles, will have to wait for the professionals. Your garage door specialists will look over the damage when they arrive at your property. If the door panels are damaged, they’ll remove them first. They remove the old spring and replace it with specialized tools. The spring must be positioned with a certain amount of tension so that the door can open with ease. Lubrication and testing will complete the service. If you have any questions surrounding your garage door, contact Star Solutions out of Jenkintown, PA. Our team can evaluate your property and suggest improvements. Your garage door does a lot of work for the household. Treat it right for years of reliable service. Should You Replace Your Residential Garage Door? Why Choose Star Solutions for Garage Doors Repair? Star Solutions Garage door. Local garage door experts are familiar with the area and can get to you quickly. Choose one with the expertise, necessary tools and equipment and trained, licensed, bonded and insured technicians to quickly and safely install, repair or replace your garage door for you. Getting affordable prices and guarantees on their work is also important.